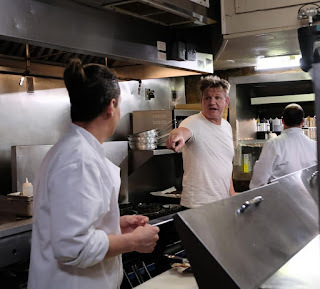 In this 24 Hours to Hell and Back episode, Chef Gordon Ramsay visits The Old Coffeepot Restaurant in New Orleans. The Old Coffeepot is in the busy French quarter but struggles to get customers. Dustin bought the restaurant after working there as a chef, when he first bought it it was busy and regarded as one of the best breakfast restaurants. The family dynamic broke down and Dustin became full time care taker for all of the children and the staff don't respect him and misbehave as soon as he leaves. Gordon installed hidden cameras in the restaurant and arrived in disguise with a troop of musicians. They order staple New Orleans dishes. The red fish is frozen, the chicken in the Chicken Fleur de Lis is contaminated and old, the toast is burnt, the eggs benedict are overcooked and the Po Boy comes with rotten fries. The staff misbehave during the service and ignore the customers. Gordon removes his disguise, introduces himself to the staff and Dustin and closes the restaurant during service. Gordon introduces his Hell on Wheels truck and shows them hidden footage from the restaurant. There is footage of multiple vermin including rats, grime, dirt and rude staff and the customers are disgusted. Gordon begins by reading negative customer reviews to the staff. It is revealed that Dawn is both manager and cook despite having no experience and that the restaurant is three months from closure. Gordon finds rented coffee pots and a dead mouse in the toaster. He inspects the kitchen and finds old chicken and three freezers full of food. Dustin reveals that his recent divorce has caused the recent dip in business as he now has full custody of his children. Gordon calls in an exterminator and they are introduced to the new menu of cooked to order New Orleans dishes. Dawns lack of culinary skills shows when she is unable to poach an egg or make hollandaise sauce and Dustin sacks her from the restaurant. The renovations are underway after a small hitch when they hit an electric cable. The staff are introduced to the new menu and love the new dishes. He also introduces a to go service to cater for the large number of tourists and the new, clean kitchen is revealed. The kitchen has been refitted with new coffee machines and more equipment. The customers love the new decor and new menu but there is a small hitch when raw chicken is returned to the kitchen. Dustins family has been invited for the relaunch, the grab and go is popular and the relaunch is a success. Three months later, business has improved and the customers love the new food. The Old Coffeepot is open and Trip Advisor reviews and Yelp reviews are mostly positive with most of the negative comments complaining of poor service and wait times for food. The owner has said on Facebook that they weren't happy with some of the changes including the removal of the mural, chandelier and some of the artwork. They have since added some dishes back to the menu and reintroduced the artwork. The Old Coffeepot Restaurant closed in February 2019. Dustin told the local media the restaurant was closing due to declining business and local construction. He also said that appearing on the show didn't give him the boost in sales he had hoped for and it annoyed some of the regulars. The Old Coffeepot Restaurant was aired on June 20 2018, the episode was filmed in October 2017 and is 24 Hours to Hell & Back season 1 episode 2. Some real, some staged but I don't see how putting back some artwork and adding back menu items will hurt - the problem wasn't the dishes but how they were made. As long as Dustin stays woke up and keeps working and studying to be a dynamic chef the Old Coffee Pot will be all right. You don't HAVE to work 80 hours a week to run a small restaurant - if you look at the operation logically, delegate and have good people you can do it in 50 hours or less easily. That leaves plenty of time for a home life. To get the best employees you treat your staff like human beings and teach them to be the best but if they can't hack it let them go and be free in the restaurant world. There are plenty of books on management and motivation in the library. The reason most restaurants fail is management.